Are your Irving, Grand Prairie, Grapevine, and Dallas area drives in need of a freshening up? Are you looking for an interior with all the modern conveniences for the job? The VW Jetta interior has a lot to offer in this regard. The folks here at Metro VW have come up with this VW Jetta interior review so you can get an up-close look at a few of its key attributes. In this review, we’ll be going over what the Volkswagen Jetta has to offer in terms of comfort and convenience. Read on to find out if this is the interior you’ve had in mind. For you, the driver, the Volkswagen Jetta makes use of a number of handy features to enhance your drive. For one, there’s the Volkswagen Digital Cockpit. This available feature lets you prioritize the information you’d like to see displayed on the dashboard in front of you on the 10-inch, high-resolution digital screen. Some of the items you can choose include travel time, fuel economy, your present speed, and elevation. Another convenient piece of technology you’ll find inside the VW Jetta is the available Driver Personalization. This feature remembers your preferred personal settings when it comes to driver’s seat comfort, radio stations, climate control, and the positions of the external mirrors. Another significant aspect of this impressive interior is the amount of comfort it affords. For example, the VW Jetta is available with Climatronic® dual-zone automatic climate control in order to provide you and your passengers with your preferred temperature settings. The heated front seats, V-Tex leatherette seating surfaces, and leather-wrapped multi-function steering wheel are also available. 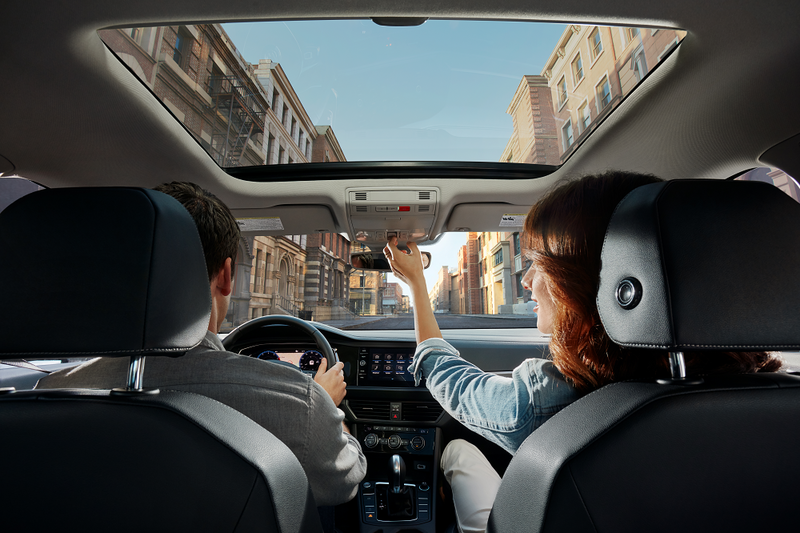 One safety feature that comes standard in the Volkswagen Jetta interior that increases your comfort levels is the Rear-View Camera System that boosts your awareness and visibility whenever you’re backing up. The VW Jetta is available with Adaptive Cruise Control that raises your comfort levels on those longer drives. Next, we’ll take a look at what this accommodating cabin has in terms of roominess. It provides seating quite comfortably for five people and has a maximum passenger volume of 94.7 cubic feet. It also gives everybody lots of space to stretch out and relax with plenty of headroom and legroom. In the front seats, the VW Jetta gives you and your passenger 38.5 inches of headroom and 41.1 inches of legroom. The folks in the back have it just as nice with 37.2 inches of headroom and 37.4 inches of legroom. With its convenient technology, comfortable features, and spacious seating, the Volkswagen Jetta sure packs a punch with what it has going on in the cabin. If you’d like to experience the VW Jetta interior firsthand to find out if this is what your regular Irving, Grand Prairie, Grapevine, and Dallas commutes have been missing, contact Metro VW today to set up a good time for a test drive.